The Eastern Front experienced the viciousness of war on a scale of unimaginable horror and brutality. The bloodiest and most savage fighting took place in Stalingrad between August 1942 and February 1943. Stalin’s city on the Volga had military significance for Hitler. It carried the name of his enemy and therefore had to be destroyed. The ensuing battle sealed the fates of hundreds of thousands of soldiers and civilians and marked the turning point of World War II. It was the beginning of the end for Nazi Germany. In their three-part, 16:9 HDTV documentary, internationally recognized, award-winning, documentary filmmakers Sebastian Dehnhardt, Christian Deick and Jorg Mullner reveal new historical facts while touching the emotions of their audience with new, moving eyewitness accounts and confessions from some of the last survivors. Filmed from both the German and Russian perspective, the series contains footage shot by soldiers during the siege. The Russian archives opened their doors to the filmmakers, granting them exclusive access to previously unreleased material. The series also contains digitally restored archive film as well as 3-D animation to recreate the city of Stalingrad and plot the course of its destruction. 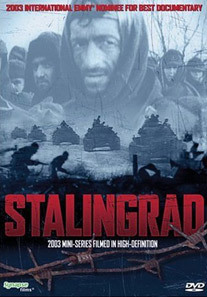 Originally broadcast in both German and Russia in slightly truncated editions, this Special Edition DVD contains all three STALINGRAD documentaries including THE ATTACK (54 min. ), THE KESSEL (56 min.) and THE DOOM (55 min.) in their original uncut forms and a wealth of extra supplementary materials.